A good recipe post should be tested out for replicability. This post is not one of those. The recipe here is not a traditional one. I conjured it. Measured and left some spices at home. Gave instructions over phone to our cook, the famous Bunkin Banu, when she came to work. She followed those. I hope. I have not cooked and tested the recipe myself. The result was quite a tasty dish according to K and me. So I thought I will share here what I told her as it might give you some ideas on cooking the dish. This post is NOT meant for those who follow recipes to the T.
Both K and I are down with bad throats so the recipe has no chilli but you can add it if you so wish. The dish is best with enjoyed with chapatis or rice. 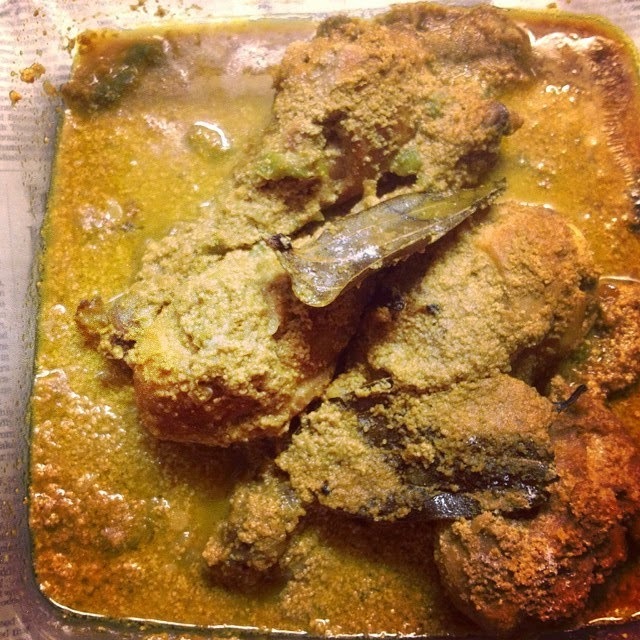 There is a traditional Bengali dish called ‘posto murgi’ too. I am not sure how that is made. So here’s what I told Banu. We spoke in Hindi but I am writing this in English so that nothing is lost in translation. · Add 4 chicken drumsticks. Salt 1 teaspoon. Spice mix (I had left 1 teaspoon each of cumin and coriander powders and half a tea spoon of turmeric for Banu to use). · Add paste to chicken. · Add 1 finely chopped ridge gourd (jhinge) to the pan. Do let me know if you try it and if it works for you. Banu did a good jo.